At Majestic Tan & Spa we offer a wide variety of services. 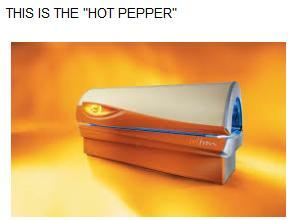 We have five different levels of tanning beds including: SUPER BEDS, BRONZING BEDS, and HOT BEDS. We have two levels of vertical STAND-UP units as well. Our beds vary in intensity and maximum exposure times depending on which bed you choose. They range from 8 minutes maximum exposure to 20 minutes maximum exposure to satisfy every skin type and every preference. 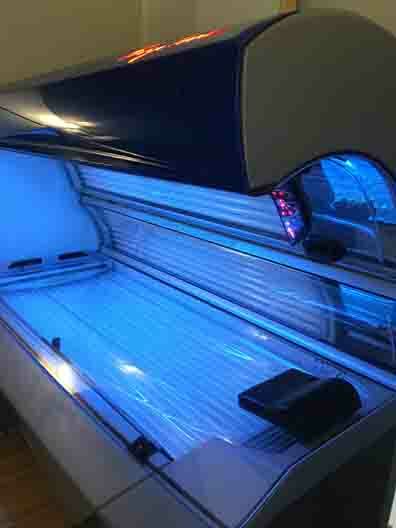 We also offer UV-FREE tanning in our MYSTIC BOOTH. 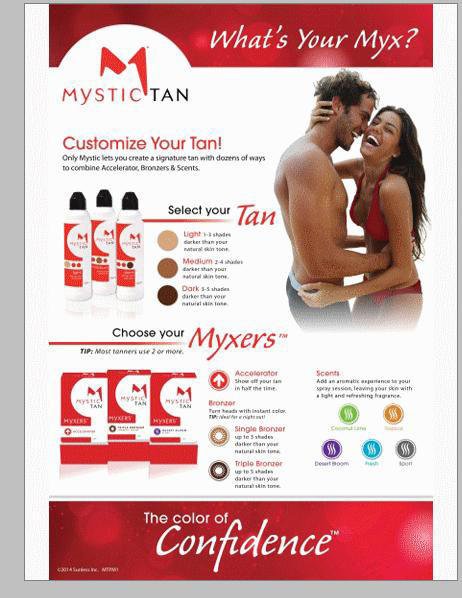 We have 4 different levels of Mystic solution to choose from including: Glow, Light, Medium, and Dark. At Majestic we also offer UV-Activating Teeth Whitening. Whiten your teeth while getting your perfect tan! 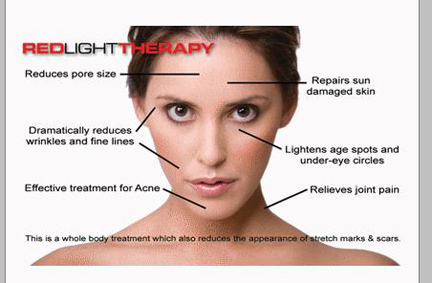 We now offer UV-FREE RED LIGHT THERAPY. Red light therapy helps to reduce fine lines and wrinkles, and diminish the appearance of stretch marks in only 3 sessions per week! Come in today and try it out. 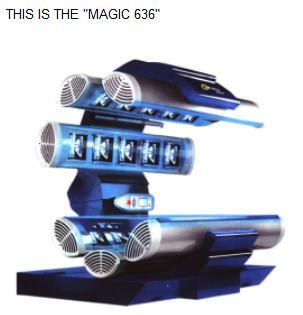 You will be amazed at the results!!! Don’t forget our FORMASTAR BODY WRAP treatment room. Lose yourself to relaxation, rejuvenation, detoxification, for an hour while you lie in a comfortable message table & lose up to 1400 calories in the process. The American Academy of Dermatology and other skin-care groups get much of their marketing budget directly from the chemical sunscreen industry. The AAD receives millions for putting endorsement logos on chemical sunscreen products – a much-criticized "pay for play" program. Sunscreen does not prevent melanoma, according to the U.S. Preventive Services Task Force, which makes policy recommendations for the federal government, "The evidence is insufficient to recommend sunscreens for the prevention of skin cancer." According to the independent Environmental Working Group – a consumer watchdog group that has analyzed hundreds of sunscreen ingredients, "Most sunscreen chemicals are far from innocuous. In sunlight, some release free radicals that can damage DNA and cells, promote skin aging and possibly raise risks for skin cancer. Some act like estrogen and may disrupt normal hormone signaling in the body. Others may build up in the body and the environment." The Skin Cancer Foundation is a marketing front group organized by sunscreen manufacturers to create a "Skin Cancer Foundation Seal of Approval" which appears on sunscreen products to convince consumers into thinking their products prevent melanoma, which they are not allowed to claim themselves. The SCF website says: "For adequate protection against melanoma, non-melanoma skin cancers and photo-aging, everyone over the age of six months should use sunscreen daily year-round, in any weather." Saying that sunlight is harmful and therefore should be avoided is as misleading as saying that water causes drowning, and therefore we should avoid water. Professional indoor tanning facilities promote balance and educate their patrons about the potential risks of UV overexposure. Consumers are required to read and sign consent forms that include warnings about potential eye damage, photoaging and skin cancer. 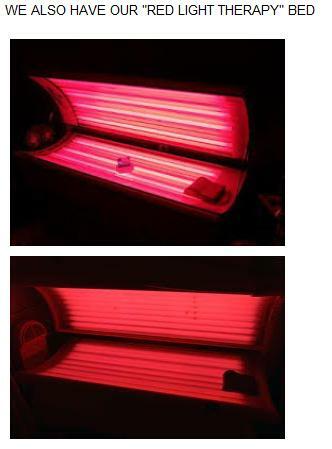 Warning labels are found on every tanning device and almost always in other general areas. Professional tanning facilities require parental consent for teenagers who tan even though most states don't require this measure. While this serious approach to caution is just good sense, it needs to be noted that understanding the risks of UV exposure is not as straightforward as some suggest. Consider: Research has not established a "causal" relationship Between Melanoma and Indoor Tanning. Melanoma skin cancer is the most aggressive of the three major categories of skin cancer, accounting for only 5 percent of all skin cancer cases each year, but responsible for a majority of skin cancer fatalities (Approximately 8,000 annually). While melanoma has captured a great deal of public attention in the past 15 years, much of the discussion has been oversimplified in stating that melanoma is caused by overexposure to sunlight. In fact, the exact nature of the relationship between melanoma and ultraviolet light remains unclear, and the mechanism by which the two are related is still unknown – which is why some independent dermatology researchers even question whether the two are related at all. While it is believed that melanoma is somehow related to ultraviolet light exposure, this relationship is not straight-forward and the photobiology research community still does not know how it works. That’s because while a minority of associative survey-studies have suggested a correlation between UV from indoor tanning and melanoma, no direct experimental evidence exists to show a causative connection. Even American Academy of Dermatology spokesperson Dr. James Spencer admits, "We don’t have direct experimental evidence" connecting indoor tanning and melanoma. Melanoma is more common in people who work indoors than in those who work outdoors, and those who work both indoors and outdoors get the fewest melanomas. Because this is true, the relationship between melanoma and sunlight cannot possibly be clear-cut. If it were a clear-cut relationship, outside workers would have higher incidence than inside workers. But the opposite is true. Melanoma most commonly appears on parts of the body that do not receive regular exposure to sunlight. Again, because this is true, the relationship between melanoma and sunlight cannot be clear-cut. If it were, melanomas would appear most often on parts of the body that receive the most sunlight. 18 of 23 epidemiological studies ever conducted attempting to correlate indoor tanning and melanoma incidence show no statistically significant association – including the largest independent study, a 2005 multi-ethnic international European study which reported, "The relationship between UVR and melanoma is very complex and, despite many studies on the topic, remains a controversial issue. Some patterns of sun exposure may also offer protection, as some studies have suggested that people with heavy occupational exposure to the sun exhibit a lower risk for melanoma compared to individuals with intermittent sun exposure. In conclusion, sunbed and sun exposure were not found to be significant risk factors for melanoma in this case–control study performed in five European countries." A 2009 opinion paper published by an ad-hoc working group representing the World Health Organization’s International Agency for Research on Cancer has been widely misrepresented in the media. That report’s actual conclusion stated, "Epidemiologic studies to date give no consistent evidence that use of indoor tanning facilities in general is associated with the development of melanoma or skin cancer." While the report attempted to suggest that performing a meta-analysis of the old data showed a 75 percent increased risk for those who started tanning at an early age, the authors failed to disclose that conclusion failed to take into account that removing those with skin so fair it cannot tan – called Skin Type I – from the analysis made the overall results statistically insignificant. Dr. William Grant, founder of the Sunlight, Nutrition and Health Research Center in San Francisco, published a peer-reviewed critique of the IARC report showing that, after adjusting for skin type, the analysis showed no increased risk with indoor tanning. Closer analysis of IARC report data (by Dr. Mia Papas and Dr. Anne Chappelle) – when separated by unsupervised home tanning equipment verses usage in indoor tanning facilities and medical usage of tanning equipment in doctor’s offices – reveals that no statistically significant increase in risk (6 percent) was attributable to commercial tanning facility usage, while larger increases (40 percent and 96 percent) were attributable to home and medical usage of tanning equipment. A 2010 University of Minnesota study on fair-skinned Minnesotans claimed to show a connection between tanning and melanoma but actually supported Grant’s point that UV-related risk seems centered on the fairest skin type. But the study also showed that those who got the most outdoor sun exposure had the lowest risk of melanoma – a divergent conclusion to the rest of the paper underscoring that whatever relationship UV and melanoma may have is still not understood. The relative risk of melanoma is very small – much less than 1 percent and very close to the relative risk for non-tanners – and is often misreported. As reported in the Wilmington News Journal, "Even the IARC’s strongest study – which followed more than 100,000 women over eight years – found that less than three-tenths of one percent who tanned frequently developed melanoma, while less than two-tenths of one percent who didn’t tan developed melanoma. Almost all the other studies in the report did not establish a strong link between the two. The overall risk of contracting melanoma – whether using tanning beds or not – remains well under 1 percent. For that reason, using the 75 percent statistic is misleading, said Dr. Lisa M. Schwartz, general internist at Veterans Affairs Medical Center in VT and co-author of "Know Your Chances," a book on understanding health statistics..."Melanoma is pretty rare and almost all the time, the way to make it look scarier is to present the relative change, the 75 percent increase, rather than to point out that it is still really rare." "Absolute risk just tells you the chance of something happening, while relative risk tells you how that risk compares to another risk, as a ratio. If a risk doubles, for example, that’s a relative risk of 2, or 200 percent. If it halves, it’s .5, or 50 percent. Generally, when you’re dealing with small absolute risks, as we are with melanoma, the relative risk differences will seem much greater than the absolute risk differences. You can see how if someone is lobbying to ban something – or, in the case of a new drug, trying to show a dramatic effect – they would probably want to use the relative risk. "-Ivan Oransky, M.D. The American Cancer Society’s key document measuring cancer rates in the United States – "Cancer Facts and Figures" – says that melanoma rates have not increased since 2000 and that rates are declining for women under age 50 - the opposite of what anti-tanning lobbying groups claim. "During the 1970's, the incidence rate of melanoma increased rapidly by about 6 percent per year. However, from 1981-2000, the rate of increase slowed to 3 percent per year and since 2000 melanoma incidence has been stable," the ACS "Cancer Facts and Figures 2008" reports. "The death rate for melanoma has been decreasing rapidly in whites younger than 50, by 3 percent per year since 1991 in men and by 2.3 percent per year since 1985 in women." A paper published by the British dermatology community in 2009 showed that "diagnostic drift" and more aggressive screening are responsible for the increase in "reported" melanomas, but that there isn’t an actual increase in thick melanoma lesions, which explains why the mortality rate is not increasing. According to the authors, "These findings should lead to a reconsideration of the treatment of ‘early’ lesions, a search for better diagnostic methods to distinguish them from truly malignant melanomas, re-evaluation of the role of ultraviolet radiation and recommendations for protection from it, as well as the need for a new direction in the search for the cause of melanoma. "The American Academy of Dermatology, for decades, has kept up a drumbeat on behalf of faith in an epidemic of melanoma and rays of the sun as the major cause of it, at the same time that it has flayed, incessantly, the tanning bed industry. Although the organization is termed an Academy, never has it presented in fashion academic a whit of evidence, available readily, contrary to its position entrenched, namely, there is no epidemic of melanoma and that tanning beds have not been proven to be a cause direct of melanoma." "There is no proof whatsoever that blistering sun-burns, no matter the number and even in childhood, enhance risk for development of melanoma and there is no evidence at all that sunscreens prevent development of melanoma. What is more, it has yet to be established that exposure excessive to sunlight (or sun lamps and tanning beds) alone, in the absence of inclination genetic, causes melanoma." Dr. Sam Shuster, Emeritus Professor of Dermatology at the University of Newcastle, penned "The Skin Cancer Cover-Up" to point out that there is no hard evidence that UV is the cause of melanoma or that there is an actual increase in melanoma incidence. Dr. Arthur R. Rhodes, Professor of Dermatology at Rush Medical College, in Chicago, believes that melanoma’s public message needs to stop focusing on UV light – pointing out that UV-melanoma campaigns are killing people who get melanoma who failed to recognize the disease because they never spent time in the sun. The U.S. National Institutes of Health’s National Toxicology Program in 2000 placed ultraviolet light on the federal government’s list of known human carcinogens. In July 2009 the World Health Organization wrote a brief report also declaring that UV light is a Class I carcinogen – a list that also includes red wine, birth control pills, salted fish and other highly used substances that, when experienced in their intended dosages, do not elevate cancer risk. Much like the NIH listing in 2000, WHO erred in not pointing out that the "list" doesn't mean a substance is dangerous in every-day dosages, but only potentially in "overexposure" situations. The listing does not mean that moderate tanning will cause skin cancer. The NIH listing criteria shows us why: "The Report does not present quantitative assessments of carcinogenic risk. Listing of substances in the Report, therefore, does not establish that such substances present carcinogenic risks to individuals in their daily lives." This exclusion – in the absence of any direct experimental research on indoor tanning and melanoma – makes this listing almost meaningless. The list does not take into account that there are positive effects to ultraviolet light exposure. Many forms of cancer – including breast, colon, prostate and ovarian tumors – now appear to be retarded or even prevented by regular exposure to ultraviolet light. This omission on the NTP list is conspicuous, given that positive effects are listed for other substances in the government's list of carcinogens that have positive effects, such as the breast cancer drug Tamoxifen, which is a Class I carcinogen. As a result, thousands of news reports suggest that "sun tanning is as dangerous as tobacco" – a blatant misrepresentation. Smoker’s risk of lung cancer: 15 percent – or 2,000 percent higher than that of non-smokers. Smoking introduces up to 60 man-made known carcinogens into the body – substances the body was never designed to process. Smoking is related to 1 in 3 cancer deaths. Tanner’s risk of melanoma: 0.3 percent – compared to 0.2 percent for non-tanners (a difference of 1 in 1,000) The body needs ultraviolet light to survive – calling it a carcinogen without that caveat is totally misleading. One thing we know for certain: You would be dead today if you did not receive any ultraviolet light. More than 90 percent of professional indoor tanning units emit about 95 percent UVA and 5 percent UVB in regulated dosages similar to summer sun. 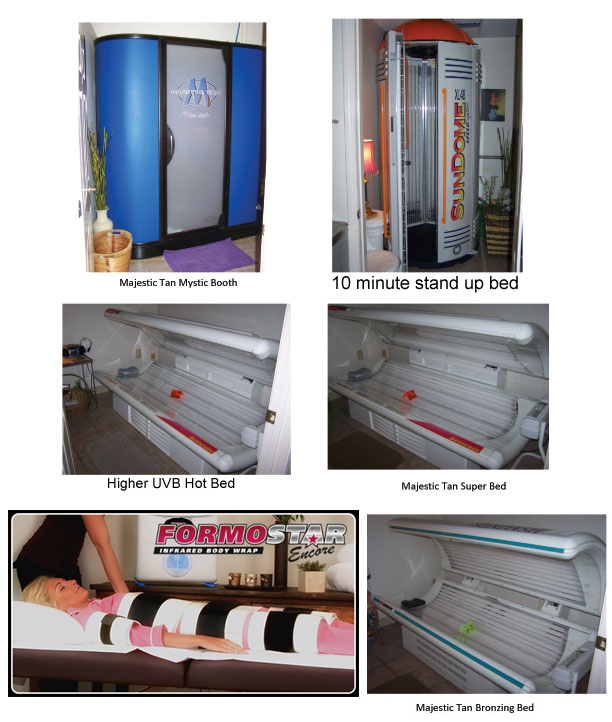 Recommended exposure schedules developed by the U.S. FDA in cooperation with the tanning industry allow trained indoor tanning operators to set incremental exposure times, based on the "skin type" of a patron, that deliver consistent non-burning dosages of UV light to allow a tanner to gradually build a tan. While tanning units may be 2-3 times as intense as summer sun, the duration of exposure is controlled, and thus the total UV output is controlled, to minimize the risk of sunburn. 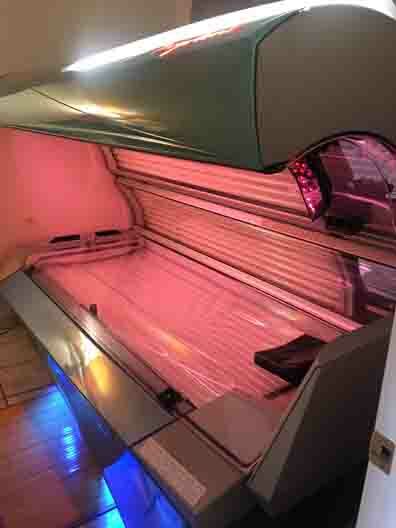 Exposure times in the more intense tanning units are calculated in similar fashion. A typical indoor tanning exposure schedule (below) allows a professional indoor tanning operator to gradually increase the exposure times of a tanner over the course of the tanner’s regimen based on the individual’s skin type. Unable to tan. Do not expose Skin Type I to indoor tanning. Less than 5 percent of North Americans are what is called "Skin Type I" – which includes people of Northern European heritages (some Irish or English people, for example) whose skin is so fair that it cannot tan without burning. North American indoor tanning protocol is not to allow these people to tan in salons, and our skin type questionnaire identifies them. If they wish to tan, they are advised to use non-UV self-tanning products. 1. Trained operators control all tanning exposure times, minimizing a client’s risk of overexposure and sunburn, and require tanners to use FDA-compliant protective eyewear, which eliminates the risk of eye injury. Clients are taught sunburn prevention and the appropriate use of outdoor sunscreen. Combined with the fact that a tan is nature’s protection against sunburn, this is why indoor tanning clients are up to 81 percent less likely to sunburn outdoors as compared to non-tanners, according to Smart Tan surveys. Because of all these safeguards, the professional indoor tanning has an exemplary safety record: From an estimated 6 billion indoor tanning sessions from 1985-2006 only 142 adverse events are reported in U.S. federal records – most occurring before 1997. That’s an injury rate of 0.0000000236 – or less than one report in every 44 million sessions over a 21-year period, with most of the reports coming in earlier years. Professional indoor tanning salons understand that it is inappropriate to make direct health claims about indoor tanning or to suggest there are no risks associated with UV exposure from any source. But regardless of what a facility can say about its services, surveys show many indoor tanners utilize tanning for more than just the cosmetic tan.